Impact toughness of the material is a crucial parameter in design of pressure vessels. Generally, at the option of the purchaser, Charpy V-notch impact test shall run for ASTM A516 (ASME SA-516) pressure vessel plates. The test shall be conducted in accordance with ASTM A370 and ASTM E-23. The simple-beam V-notch specimens shall be prepared sized of 10 mm(width) x 10 mm(thickness) x 55 mm(length). Three specimens for each heat lot shall be tested. The energy absorption of each specimen and average energy absorption for 3 specimens shall be recorded. 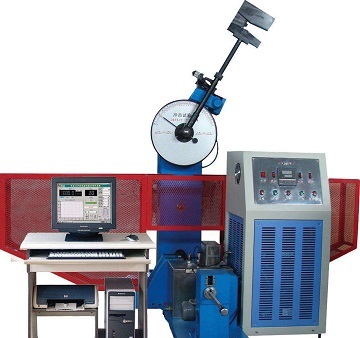 The Charpy V-notch impact test for ASTM A516 Gr.65 plate. According to ASTM A20, ASTM A516 Gr. 55, Gr. 60, Gr. 65 plates are Class III steels which are killed with a specified minimum tensile strength of 65 ksi or lower. ASTM A516 Gr. 70 plates are Class IV steels which are killed with a specified minimum tensile strength of over 65 ksi to 75 ksi. The acceptance criteria of energy absorption are listed in below table. *The materials shall be furnished in quenched and tempered condition. Depending on different plate thicknesses t, the minimum test temperatures are also stipulated for each steel grade respectively. 1" < t ≤ 2"
2" < t ≤ 3"
3" < t ≤ 5"
*The minimum temperatures listed are for longitudinal tests. For transverse tests, it may be somewhat higher.